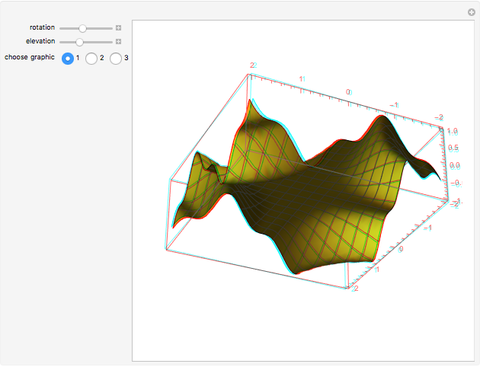 3D anaglyph images can be easily created from 3D graphics objects or plots. The module anaglyphview converts the graphics into a color anaglyph image. The resulting anaglyph image can be viewed with red-cyan glasses, creating a stereoscopic 3D effect. Red-cyan anaglyph glasses can be easily obtained from various internet retailers at a very low cost (less than $10). The author recommends plastic anaglyph glasses (rather than paper) or plastic anaglyph clip-ons for people with reading glasses. 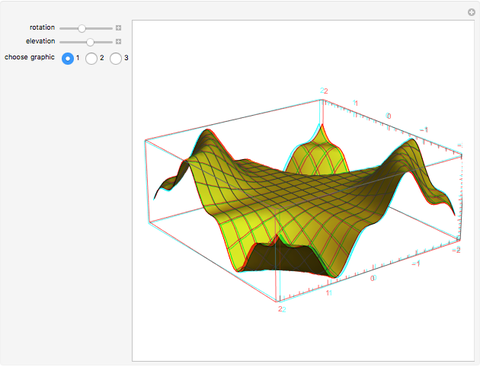 The module anaglyphview takes as its inputs a 3D graphic or plot, a view angle, and a view elevation. Two images are created (one for the left eye and one for the right eye) and decomposed into their respective red, green, and blue (RGB) components. The RGB components of both views are then recombined for the color anaglyph image. Kay Herbert "3D Anaglyph Graphics"